"Jane Thistle was happily married to a career military officer whose job took them all around the globe. But now that he's passed, she's happy to call the quaint town of Tullulah, Alabama, her new home. Her new best friend, Phoebe Twigg, is also a widow, and has lived in Tullulah all her life. Phoebe is about as different as could be from the worldly and refined Jane. But Phoebe's warm, welcoming Southern nature wins her over, and the two women end up making quite a pair. Especially when they stumble over a dead body while on a walk in the woods ..."
This was a fun read! I really enjoyed Phoebe's character! Looking forward to this one. I ejoyed the other book I read in this series. I enjoyed this one just as much as the other one I read in this series. Took to the Christmas meet-up dinner to release. Enjoy! 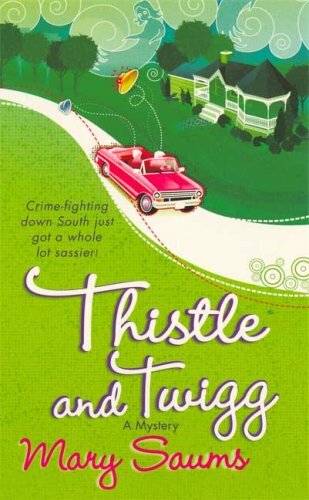 Great friendship between the Jane and Phoebe strats in this book plus a couple of mysteries. I liked this story - it was lots of fun. I picked it up at www.rhizomecafe.ca a few weekends ago. It was a fun quick read!